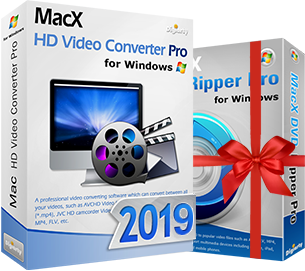 MacX Video Converter Pro for PC - Holiday Offer The special offer is valid till Apr 30, 2019. List Price : $45.95, Save 35% Discount Price from: $29.9530-day Money Back. 100% Secure! The payment is processed by Avangate. We accept Visa, MasterCard, American Express, Bank/Wire transfer, Maestro, JCB, Discover, iDEAL, Diners Club, Direct Debit, etc. Seamless support for the latest OS and devices, such as Windows 10, iPhone 8/X, iPad Air 2 and more. DVD Ripper Pro - No.1 fast. Backup DVD in 5 mins without losing quality. Digitise DVD to MP4 H.264 AVI WMV iOS Android, etc. DVD Ripper Pro– Backup DVD in 5 min without losing quality. Digitise DVD to MP4 H.264 AVI iOS Android, etc. MediaTrans - The easiest and most powerful iPhone/iPad manager. Transfer video, photo and music between PC and iOS.